It’s been a solid five months since the internet lost its collective marbles trying to find the stupid panda in a sea of snowmen, so it seems about time for a new optical illusion to sweep the web. 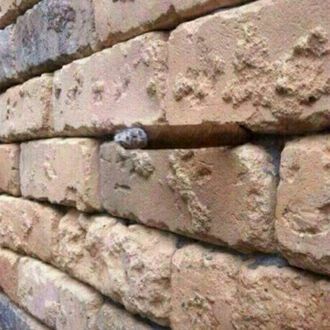 Well, here it is: a picture of a mysterious brick wall that had me scratching my head until one of my colleagues took pity on me and made me feel like a complete idiot for not seeing IT in the first place. Do you see it? No? That’s okay. We can go get eye exams together. The illusion made the rounds on Reddit a few months back, but it’s recirculating today in the One Direction Twitter-sphere (where we found it, obviously) and on Imgur. In case you’re still in the dark, look closely at the seam between the second and third layer of bricks from the top. Still lost? There is a partially burned cigar shoved horizontally in there. Isn’t the internet great?